If you've visited Midcoast Maine in the past quarter century of summers, you're probably aquatinted with the state's most notorious traffic bottleneck: Route 1 as it passes through the historic village center of Wiscasset and then over the bridge crossing the Sheepscot River. There's not much way to avoid it -- unless its backed up for miles, in which case even an extra twenty minute diversion up to Sheepscot Village in Alna and back around again is worth it. The Maine Department of Transportation has a fix in mind. But in today's Portland Press Herald I report on how the town has just filed a suit against the agency, asking a judge to block the plan which they allege breaks state law as well as local ordinances. The project, critics have said, will destroy the downtown, level a 101-year old building, cost Maine taxpayers a load of money, and won't improve the traffic delays. Sounds like a story worth following. For this week's Maine Sunday Telegram, I asked a number of presidential scholars, biographers, and political scientists what effect they thought the serial groping allegations against former President George HW Bush would have on his legacy. Bush is accused of groping ten women -- one of whom was 16 at the time of the alleged incident -- the earliest in 1992 (when he was still president) and the most recent in the summer of 2016. He has not denied any of the allegations and has apologized for some of them. As you'll read in the piece, scholars say the effect on his legacy will likely be minimal -- assuming nothing further comes out -- in part because not very many people are paying attention. I wrote about the groping allegations a few weeks ago, wherein we broke news of the fourth accuser, a former Maine Republican state senate candidate. "Mayday," the Portland Press Herald series on the effects -- now and moving forward -- of the rapid warming of the Gulf of Maine, came out two years ago and concluded that Maine wasn't doing enough to confront the threat, particularly in regards to ocean acidification, which is something experts say can actually be mitigated at the state- and local-level. So what's happened since? As I reported in yesterday's Maine Sunday Telegram, the state government has essentially done nothing, with legislators choosing not to fund the key recommendations of the bipartisan panel they'd convened to study the problem, or even to enable it to continue working. Leadership and action on the issue has been left to a scrappy group of volunteer scientists and conservationists concerned about the problem. With Maine's fishing and aquaculture industries at risk, there's some choice words from experts on the issue. Details herein. For more on the problem, consider reading the "Mayday" series (which was a finalist for the 2016 Pulitzer Prize in Explanatory Reporting) and, especially, the parts on ocean acidification and state inaction. For months now I've been covering Maine Secretary of State Matthew Dunlap's participation in President Donald Trump's Commission on Election Integrity for the Portland Press Herald. In that time, Dunlap -- one of four Democrats on the now-11 member panel -- has gone from open-minded and cautiously optimistic that the body would be acting objectively and in good faith to a shock and outrage. In September Dunlap became openly critical of the actions of Vice Chair Kris Kobach, the Kansas Secretary of State who is running for governor of that state and has become a paid columnist for Breitbart, Steve Bannon's controversial media outlet. Kobach had declared there to have been widespread fraud in New Hampshire's 2016 election, citing voting by out-of-state college students that is explicitly legal under that state's law. He was additionally upset to learn, shortly thereafter, that two members of the commission had tried, before being appointed, to ensure no Democrats or "moderate Republicans" be appointed to the body. Matters have escalated since then, as Dunlap and other Democrats on the body stopped receiving any communications from the commission. Dunlap first responded by formally requesting the group's calendar and working documents, then by filing a federal lawsuit to obtain the same. Now, as I reported in Friday's Press Herald, he has asked the judge for an injunction forcing the body to provide him the documents and to treat him equally as other commissioners. Kobach and allied commissioners are firing back, calling him"paranoid." For those following the effort to resolve jurisdictional and territorial conflicts in and around Acadia National Park, I had an update recently in the Portland Press Herald. The bills that would fix the issues -- now revised to reflect public comments and supported by the entire Maine Congressional delegation (two Republicans, a Democrat, and an independent who caucuses with the Dems) -- is finally advancing, with a long delayed hearing scheduled for tomorrow at the US House Natural Resources Committee. Among other things, it explicitly permits clammers and wormers rights to dig in the inter-tidal mudflats adjacent to park land. No, the great US political divide isn't rural vs urban. Here's the proof. 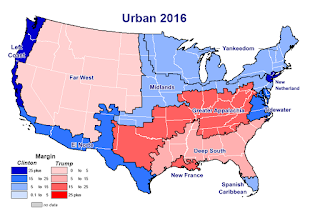 One counter-argument I often hear in regards to the political effects of the American Nations is that regionalism isn't important, that the salient divide in American politics is actually between rural and urban voters. Nonsense, I've said again and again and again. And now I have comprehensive federation-wide data to prove it. I crunched the numbers for the past three presidential elections, revealing and comparing not only how rural and urban voters behaved in each of the United States' eleven regional cultures, but even how specific categories of counties voted, from the major metro core counties to the most remote and rural. I've released the results, posted with maps and tables galore, over at Medium as the latest installment of my ongoing American Nations-powered series, "Balkanized America." They show that regionalism overwhelmingly trumps population density when it comes to political behavior, with people from each class of county exhibiting enormous differences between "nations." In five of the regional cultures that together comprise about 51 percent of the U.S. population, rural and urban counties always voted for the same presidential candidate, be it the “blue wave” election of 2008, the Trumpist storm of 2016, or the more ambiguous contest in between. In Greater Appalachia, the Deep South, Far West, and New France, rural and urban voters in aggregate supported Republican candidates in all three elections, whether they lived in the mountain hollers, wealthy suburbs, or big urban centers. In El Norte, both types of counties always voted Democratic, be they composed principally of empty desert or booming cityscapes. I’m not saying urban/rural electoral divides don’t exist – they do in every nation, from France to India – but their predictive power is often greatly exaggerated. And in the case of US presidential elections, they are a grossly inadequate means to interpret the results. Today Maine's member of President Trump's voter fraud commission sued the body in federal court after its staff for weeks ignored his request for documents and information about its deliberations. Secretary of State Matthew Dunlap, one of four Democrats on the 11-member body, filed the suit at the federal district court for the District of Columbia, alleging violations of the Federal Advisory Commissions Act, which requires commissioners receive communications equally. For today's story I also interviewed outside experts and another Democratic member of the commission, New Hampshire Secretary of State Bill Gardner, who says he is seeking to see the best in the body. All that in the article. For more background on Maine's nutty inter-tidal property/access/harvesting laws, see this feature I did a few years back.